Searching for sauna dealers is a little like looking for good car salesmen. You want someone you can trust who will give you the best price, sell you a quality product, stand behind the warranties, and be available if and when you need help. Luckily for all of us who love saunas, manufacturers sell their products online directly to consumers. They have their own websites to give you complete information and they will also sell through important online market venues such as Amazon and eBay. Except for top-of-the-line sauna heaters which are made in Sweden and Finland as well as the U.S. and Canada, we recommend and endorse sauna dealers located in North America. There are some decent cabinets made in Asia but keep in mind that once the 400-lb unit is unloaded off the boat and shipped to your house, you’re on your own. No help, no customer service, no returns. WHAT KIND OF WOOD IS IT MADE FROM? Saunas are designed to fit into a home’s décor, so they are generally made from natural wood as this provides a more attractive look. All types of wood are not created equal, however, and it is important to choose wisely to ensure that your sauna is safe as well as attractive. Aside from safety concerns, other important qualities to consider are color and smell, both of which can affect your enjoyment of a sauna from an aesthetic viewpoint. Darker woods can result in a more claustrophobic, cave-like feeling while lighter woods give a more open, airy feel. Some woods give off a pleasant odor while others are odor free, making them more attractive for individuals who suffer from allergies. 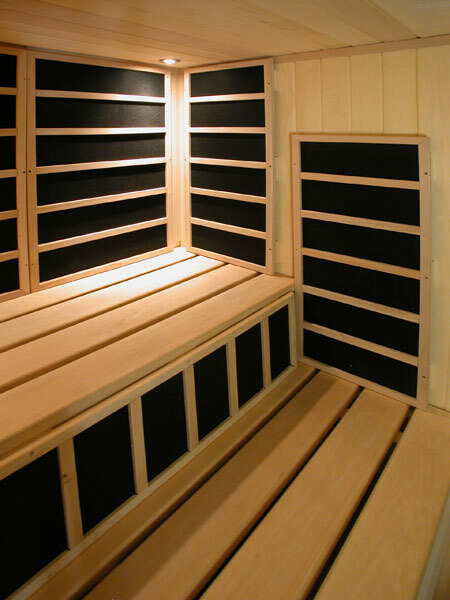 Basswood – a popular choice for most low cost saunas because it is light, soft and inexpensive. It is a particularly good option for those with allergies, as it is hypoallergenic and odor free. It is a durable wood that stands up well to the heat of a sauna and has very few knots. Cedar – one of the best choices for sauna use as it stands up better than most woods to heat and has a natural resistance to moisture. Does not warp, twist or shrink as much as other wood which helps it retain its looks for a long period of time. It does not produce out-gassing and is the best thermal insulator among sauna woods. Pine/Spruce/Hemlock – These are all relatively inexpensive woods, which makes them the popular choice for low end saunas. However, they all tend to have a lot of knots, inconsistent color and thinner planks, which means that they are less likely to stand up to the temperature extremes of infrared saunas. Also, they are more prone to odor and out-gassing, which can irritate eyes and nasal passages and makes them a bad choice for individuals with allergies. IS IT FULL SPECTRUM OR JUST FAR INFRARED? Naturally, when it comes to the therapeutic benefits of an infrared sauna, more is better. The more area of your body that is permeated by the infrared waves, the more thorough the benefit will be. For this reason, full spectrum saunas are preferable as they offer the most coverage possible. That being said, far infrared saunas, which are the most common type on the market today, are perfectly acceptable provided that the heater used is of the highest quality. Only a handful of companies offer full spectrum IR, including Clearlight/Jacuzzi, which is one of our top picks for infrared saunas. WHAT TYPE OF HEATING SOURCE IS USED? Steel/Incoloy Rod Heaters – Since most of the heat produced by incoloy heaters is actually directed away from your body, they have to compensate by using a reflector to widen the range of the heater. For this reason, they are inefficient and much less effective than other heaters. Ceramic Rods/Tubes – While ceramic heat sources are more effective than steel rods, they too have a very small infrared emission surface. They also have to operate at a higher temperature in order to produce the necessary infrared energy, making them a potential safety hazard if you come in contact with the heating surface. Their small emission surface makes them less than efficient, resulting in hot and cold spots throughout the sauna. Carbon Panels – these are the most efficient and safest type of heat source. Not only do they reach the desired level of infrared energy easily, they have a much lower surface temperature and heat is more evenly distributed over a larger area. The result is a warm, gentle, soothing heat that you can feel almost immediately and cooler surface temperatures, making it more comfortable to stay in the sauna for long periods of time. This makes carbon heaters particularly helpful for those seeking relief for chronic health conditions. ARE THE HEATERS LOW EMF/ELF? HAVE THEY BEEN TESTED? EMFs, or electromagnetic fields, are physical energy fields produced by electrically charged objects. Though there is some concern about the effects of long term exposure to EMFs, the amount produced by most infrared saunas is not considered hazardous. The most common side effect with prolonged exposure is burning, just as you might experience with any heat source. 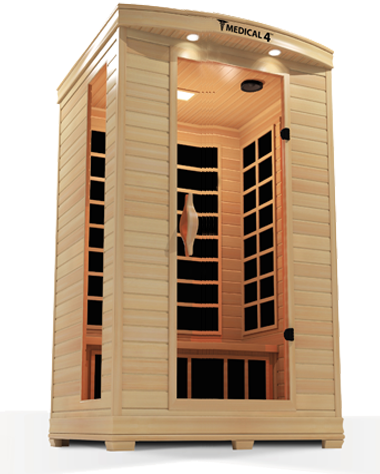 If you are particularly concerned, you should check to determine whether the sauna you purchase has been tested to determine its EMF level and ensure that it falls within safe parameters. The better companies will have independent testing performed, and you can view the results of those tests on their website. DOES IT OFFER FULL HEAT PENETRATION? In order to get the maximum health benefit from your infrared sauna, you need to have thorough heat penetration. With 360 degree heat penetration, you can be sure that the therapeutic benefits of the infrared waves are reaching every part of your body. That means ensuring that any spa you purchase has heat sources beneath the bench, under the floor to heat your feet, and on either side of the door to reach the front of your body. DOES IT HAVE THE PROPER SAFETY CERTIFICATIONS? Since infrared saunas are electrical appliances with many different parts that can break down and become hazardous, it is crucial to ensure that any model you purchase carries all of the proper safety certifications. Look for the various symbols from the national and international regulatory agencies to verify that your sauna is certified safe. Again, the better companies like Clearlight and Sunlighten will proudly display their saunas' safety certifications on their site. WHAT IS THE COMPANY’S BBB RATING? You want to be sure that any company you deal with is reliable and there is no better measure of that than a good rating with the Better Business Bureau (BBB). There are many less than reputable third party dealers operating today, especially online, so checking the BBB rating is extremely important if you want to avoid hassles down the line. If people have been complaining about the company, you want to know about it. WHAT KIND OF CUSTOMER SERVICE IS PROVIDED? Unfortunately, problems can occur and if you do run into issues with your infrared sauna you want to be sure that you can get help as quickly and efficiently as possible. Check and make sure there is a customer service number you can call and whether you will actually be able to talk to a real person. You'd be surprised at the number of sauna retailers that don't have live help for new or existing customers. If all they offer is email support, definitely look elsewhere. Many sauna cabinets are now being mass manufactured in China and while the cheap price is inviting, if you buy one of these you may have little to no chance of getting customer service help if you have a problem. Ideally, you want to find sauna dealers who design, build, and ship their products in North America, as well as those who love the business and who really understand the concepts of proper sauna design. Chances are you won’t need customer service, but being able to rely on the love and knowledge of sauna enthusiasts who sell their own products is a great advantage. IS DELIVERY/INSTALLATION INCLUDED AND IS IT EASY TO ASSEMBLE? You're obviously not going to pick up the sauna and load it into your car, so it will need to be delivered to your home. Find out what's involved in the process...is delivery included with the purchase price? Will they install the sauna for you or are you on your own? How hard is assembly and what do you need to do to prepare for delivery? This should all be very clear so you know exactly what you are getting. IS IT EASY TO USE? WHAT EXTRAS ARE PROVIDED? Before buying any infrared sauna, you should take a close look at the control panel and find out exactly how difficult it is to handle. You want controls that are easy to use so that you can enjoy your sauna without added stress. Also, there are many different models of infrared sauna on the market today, many of which offer extras such as a sound system/wifi capability and designer lighting. Don’t forget to check out exactly what comes with the model you’re interested in so that you know exactly what you’re getting. You may not need the extras, and if so you could save a little money by eliminating some of the unnecessary extra features. An infrared sauna is a major purchase and as with any purchase of this kind, you want to have some type of warranty to fall back on should anything go wrong. Since there are so many parts of an infrared sauna that could potentially cause trouble, you want to be sure that the warranty offered covers any eventuality. Also, you want to be sure that it covers the entire life of the product and not just a limited amount of time. ARE THE HEATERS AND CONTROLS INCLUDED? This sounds like a no-brainer but every dealer prices their units differently and while some material kits are all inclusive others do not come with the heater and controls and must be purchase separately. Ask up front what is included in your purchase. In addition, the best sauna dealers will have the manufacturer specs to sell you only the exact size and model heater you need depending on the cubic size of your room. DO THEY OFFER CHOICES OF SAUNA TYPES, WOOD AND ACCESSORIES? The better sauna dealers will be offer the finest quality in cedar and hemlock woods, pre-fab and pre-cut kits and modules, and should even include traditional sauna accessories such as the bucket, ladle, rocks and thermometer. You can ask about what options they have for upgrades such as digital controls, etched glass doors, color therapy lighting, and more. DO THEY OFFER HELP WITH THE DESIGN AND LAYOUT OF THE SAUNA SPACE? You can save money by installing a pre-cut sauna kit and doing the wiring and framing yourself. A qualified dealer will be more than happy to assist you with the design schematic for a custom sauna or any special need such as an odd sized space. They will also explain to you the best placement for the benches and heater, go over insulation requirements and so on. Take advantage of this expertise -- it’s included in the price. When comparing sauna dealers, you’ll want to select a group who offer similar styles at competitive prices. Visit each of their websites to see if they list where their manufacturing plant is located, where they obtain their wood, how long they’ve been in business, and so on. Your sauna is more than a box with a heater; it’s a big investment and you want to be confident that your dealer is willing to share his expertise and work with you to find the right sauna to fit your budget and lifestyle.